(816) 875-9311 Free Digital Marketing Consultation for Kansas City Businesses! Want More Online Customers? Without SEO Your Business is Invisible. You Need Results. Anything Else is Just a Waste of Time & Money. Make Some Noise. Let New Customers Know Who You Are. At TTP Online Marketing, we don't expect you to just take our word. We back it up with monthly reporting that shows you exactly what results you're getting from our expert marketing efforts. Not only that, you won't need to spend an arm and a leg to get it. Give us a call about our affordable pricing options. Online marketing isn't just about exposure. It's about getting the highest return on your marketing investments. Our goal is to give you the most bang for your buck and provide you with highest possible ROI for your online marketing. We love the Chiefs. We love great BBQ and We love helping Kansas City businesses grow. We know the value of working closely with local businesses. Why work with a marketing company on the other side of the world when you can talk face to face with a company who's right around the corner and cares about our communities economical growth. Let's meet and talk about how we can help your business grow. If your business is in the Kansas City area you not only get the benefit of being able to talk face to face with your online marketing manager, you don't even need to leave the office to do it. We love getting to know our clients and seeing first-hand how their business operates. Scheduling an in-person meeting to go over your next marketing strategy to maximize your online results is a great benefit we love providing our clients. However, we know you're extremely busy and that's why we take the time to come to you. Why drive to our office when you can meet with us in the comfort of your own. We know that no two small businesses are alike. You're unique in comparison to your competition and that means you require a custom marketing plan that is unique to your business. At TTP, we don't go for the typical cookie-cutter marketing strategies. We aim to design a hand-tailored online marketing solution that will offer you maximum results on your investment. 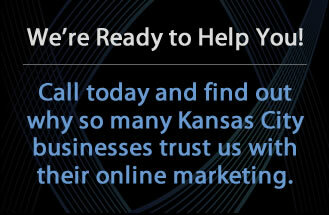 Kansas City businesses love how we adapt each strategy to fit your budget. We treat your money like it's coming out of our own pockets in order to give you the maximum results for whatever budget you allow. It has increased our business by about 30% and has been one of the best decision we have made in 10 years of being in business. I have been working with TTP for a little over a month and a half, and can say that in the past 2 weeks we have really seen an increase in our exposure. TTP has been a pleasure to work with, we speak a few times a month so that they can stay up to date on our progress and to go over new initiatives. After each call I am sent an email detailing what was discussed, what they have completed, what they are working on and things that I need to address. I would definitely recommend TTP to other businesses who are looking to start, revamp, or add to their internet marketing efforts. During month number three of the web optimization project, our company had its best week ever in the automotive division. What’s more, this week is on track to surpass last week’s record breaking action. It appears that the activities of the SEO team have begun to pay great dividends. The phones are ringing and the appointment book is full. I contribute the outstanding results to Turn The Page Marketing. The staff is not only knowledgeable and professional, they are a joy to partner with on the SEO project. THANK YOU THANK YOU THANK YOU!! You are so rockin’ awesome! I know more about web design after spending 35 minutes with you than I ever did before!! Thanks so much for coming out and spending time with me. I can’t wait to dig into all the lessons! Our school had a very positive experience working with Turn The Page. We found out about them while admiring a school website they had done. Months later I can email their team and get a quick response and they are always available to help in any way. Being long distance has not affected us in any way and I recommend their services. We are pleased with our website and have received a lot of positive comments about it. Turn the Page’s Myron Lui knows how to deliver results. His attention to details is unsurpassed, his creative forward-thinking is a blessing to all of us at TBC-Belton. He understands that TBC-Belton wants to continue to be a franchise leader and ground-breaker. We may push the envelope now and again or present a challenging project to Myron, but never fear, his calm demeanor always prevails. He just HITS IT HARD by focusing and finishing! As a medical professional new to marketing, I was very impressed with the final website designed and produced by your team. The final product was better than my expectations. We offer free Digital Advertising reviews to Kansas City businesses! Find out what's working and what's not working with your current online marketing strategy. Call us today at (816) 875-9311 to learn more. TTP Kansas City proudly serves Prairie Village, Kansas City and the surrounding areas.